Next to the glamorous Anantara Vilamoura and just 5 minutes by car from the centre of Vilamoura, The Residences at Victoria Algarve, managed by Tivoli Hotels & Resorts is a modern residential development comprised of modern and spacious holiday apartments. Our 5 star hotel in Vilamoura, Portugal has everything you need for a great family holiday, combining the comfort of home with the exceptional service of a luxury hotel. Perfectly integrated into the surrounding landscape, The Residences at Victoria has 3 swimming pools, a fitness centre, children's playground, 2 support bars, a 24 hour reception with doorman service, and other facilities. Consisting of 72 two-bedroom apartments and 73 three-bedroom apartments spaciously distributed across a modern residential development, The Residences at Victoria Algarve combine the comfort of home with exceptional hotel service. With top-end appliances, splendid Algarvian scenery and sophisticated hotel facilities and decor, these contemporary sanctuaries have been carefully designed to give you the utmost convenience and total privacy. Eleven golf courses are available within a 15-kilometre radius, including the neighbouring Victoria Golf Course, making The Residences the perfect stay for golf enthusiasts. From the windows and balconies of your apartment you can enjoy a privileged view of the Laguna and Millennium golf courses, which are within walking distance of the development. With three outdoor pools, one exclusively dedicated to children, The Residences is the perfect place for sunny days. Unwind by the pool, relax on a lounger under the shade of a palm tree and indulge in light snacks at the Tikki Bar. The Residences at Victoria Algarve feature a fully equipped fitness centre and two adult swimming pools, one outdoor and one heated. The leisure facilities are perfectly integrated in the wonderful surroundings, where you will find several options to fulfill your vacation days. The Residences at Victoria Algarve offer the best facilities for those traveling with family: an indoor playground, an outdoor park and an outdoor swimming pool for the little ones. Let your kids play in our T/Kids space. Have some family fun and create wonderful memories in one of the best locations in the Algarve, in a setting of calm and peace. From April to October, all guests of The Residences can enjoy the access to certain facilities at Anantara Vilamoura Algarve Resort, our adjacent sister property. Lounge by Anantara's stunning exterior Palms pool while youngsters take part in Adventurers Kids & Teens Club activities (subject to availability and additional cost). With just a 20-minute drive from Faro International Airport and close to the region's major highways, The Residences at Victoria Algarve is a tranquil hideaway nestled among the fabulous scenery of golf courses. The Residences is five minutes away from the Marina and the centre of Vilamoura, where you can find local shops, restaurants and entertainment. Enjoy spending the rest of your days in the quiet location of your apartment. 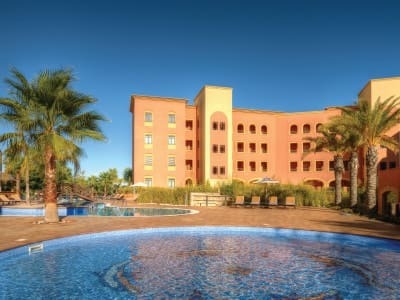 Enjoy extra nights at The Residences at Victoria Algarve and benefit from savings of up to 20%. Book early, save more! Get up to 20% off. Tivoli has great savings for you to truly enjoy your holidays. The Residences at Victoria Algarve offers you a variety of Local Experiences totally dedicated to you and your tastes, your time, expectations and travel motivations, created to reveal the authentic and local twist of the Algarve. Choose one of those local experiences and feel the real Algarve.